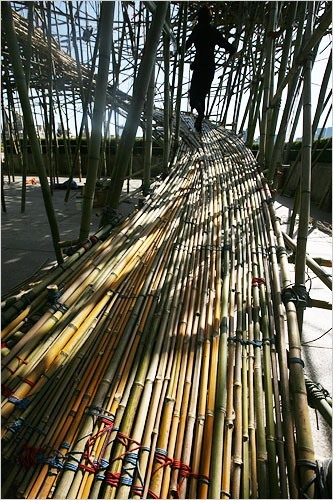 This summer if you are in New York get yourself in some rubber soled shoes, buy a timed ticket in advance and run to the rooftop of The Met for The Big Bambu. It's green, literally. It's made from one of the most sustainable materials around. And it's even recyclable! And you can walk through it! This art installation from April 27 through Oct. 31 by twin artists Mike and Doug Starn will be a site-specific installation for the Metropolitan Museum of Art that is part sculpture, part architecture and part performance. This evolving sculpture, called "Big Bambu" will be a monumental bamboo structure in the form of a cresting wave rising as high as 50 feet above the roof. More behind the scenes images here!